“Diwali is the perfect time to brighten up your home and bring in that cheerful vibe. Add mirrors to open up and brighten your space, as light and colour are reflected in them,” says Aarti Aggarwal, Creative Head, Knock on Wood (KNW). The main entrance can be eloquently decorated with flowers and colours. Addition of an extra table furnished with Flower vase and pretty flower arrangements can give a sumptuous look! Why not let the compliments and blessing enter through a reincarnation of Heaven. There can never be a life without two perspectives. Maybe that signifies why God gave us two eyes! Sometimes, the treasure is right in front of us, but it remains hidden. If you aren’t satisfied with the placement of your furniture, try making the most utilized room, like the main entrance and entertainment place— the living room complete makeover by maybe shifting the position of couches and chairs to a position better to get together, having a cup of coffee together. Lifes’ an experiment, right! Shining bright colours can be used to bring the festive mood. The easiest way is by changing the drapes. Select the colour theme that complements the furniture. Soft fabrics like silk, which indicate luxury with intricate designs can add glamour and bring joyous mood. Even if upholstery cannot be changed, just an addition of cushions can bring liveliness and festive look to the surroundings. Life’s a rainbow, isn’t it?! Let the festive feel begin with the fragrance of holy and happy scents. Incense or candles; anything that gives refreshing aroma enhances to the festivities. Side tables with incense and a religious fixture or a centrepiece with aromatic candles or floating candles kindle the festive celebrations. May it be agarbattis or some deo; it’s all in the nose! Break the monotony of the year-long silent walls and decorate them with vibrant colours and mirrors. Use wood or any other material to give a texture to your wall by creating a mural. Give accessories a chance to rebound a different look, vis-à-vis a clock with the different structure; new wall rack, photo frames and above all mirrors. Mirrors reflect the decor of the room and provide spacious and shining walls. It may be entrance or hallway or living room, flowers always brighten up the environment with natural beauty. Special ode to Gods is given by flowers and having flower arrangements not only adds to religious piousness but also symbolizes fresh new start. From the entrance to the living room; from side tables to the centre table, flowers give the essence of holiness. How can the floor go unattended and bland without colours? Rangoli beautiful, colourful and auspicious designs made with powdered colours or flowers at the entrance adds to the festive environment. Nowadays, ready-made stencils are available for easy rangoli formation, so that the colours do not smudge. Rugs and carpets give an altogether different dimension, from casual to formal, from homely to festive, with the decorative floor ensuring your house is ‘Indian Style’ from top to bottom. 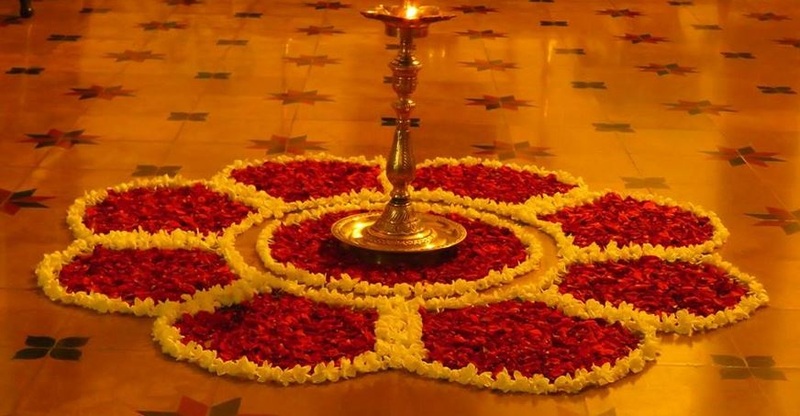 There is no end to the rangoli like black hole of decorations! You envision and you execute! Flowers, mirrors, furniture— wooden or metallic, murals, cushions, curtains, wall clock, photo frames, rugs, rangolis, not to miss out on a different type of lighting systems are all in your hand! Celebrate with your loved ones! Our main aim is to create and bring the spirit of the festival with simple means. These are arrangements and re-arrangements of the available resources that add a personal flavour to the festivities! The festive theme is nothing but a reflection of your warmth and personality that make the place look welcoming and comfortable.